Introducing Gustav Klimt to your students is really like opening up a pot of gold. There are so many interesting facets to his art and his life. One of the most impactful pieces to his story is how many of his works were destroyed by the Germans during WWII. Medicine, painted in 1900-1907 was destroyed along with a few others. 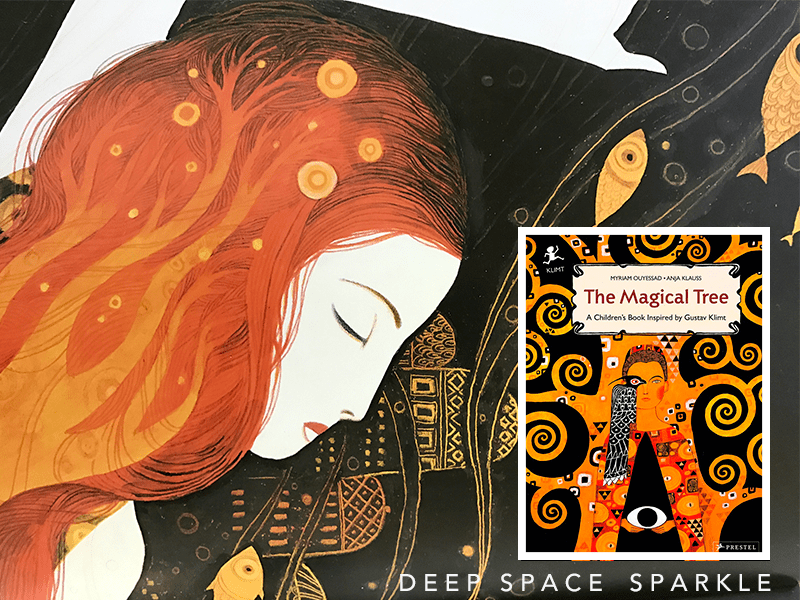 I recently picked up a book that features beautiful Klimt-inspired illustrations. If you are doing a lesson on Klimt and in particular, his Tree of Life, I encourage you to find a copy of this book. Perfect for grade 3 and up. Klimt was a part of a group of artists that were tired of traditional art and wanted their art to symbolize something beyond the canvases. They used bright colors, swirling lines and curves. They called this new style of art ART NOUVEAU. Klimt was famous for his paintings of women. They were both decorative and abstract. The Magical Tree tells the story of a magical tree whose fruit saves lives. Inspired by Gustav Klimt's mural, The Tree of Life, the book tells the story of Djalil, a young man who gains the power to see into the future after tasting the fruit born of his magical tree. Beautiful illustrations plus an reproduction of the Tree of Life painting. Here is a video I created for my members in the Deep Space Sparkle Members' Club. It demonstrates a few printmaking techniques using metallic tempera paints, regular drawing paper and a few recyclables that you can find around your art room. The video can be used as a warm-up to a more detailed Klimt lesson or used all on it's own. One of the easiest ways to do what you love most, is to have a library of art projects and resources at your disposal for quick and easy access. Accessing dozens of art bundles like this Klimt Artist bundle with posters, student worksheets/answer keys, coloring pages and drawing guides, standards sequencing guide, prep list and of course, the lessons, is the easiest way I know to deliver an art unit with little effort! Oh my goodness I cannot WAIT to become a member!!!! I just started my own business teaching after school art to kids out of my home–and I have you to thank so much for the inspiration to be brave and go for it! I’m “Pike Road Art & Soul” (don’t even have a website yet-oh goodness!) but I am enjoying terrific success as I slowly build my clientele through our local school where my kids attend. It has been amazing and I’m so grateful I get to actually LIVE my passion for art and teaching! I cannot wait to be able to get to know you even more through your club. I’ve been following you faithfully since I found you 6 months ago. I have really enjoyed your 101 class, have listened to almost every single podcast and have loved everything I’ve bought and downloaded. You are an incredible blessing!!!!! I have been exploring your site and cannot find how to become a member? I would love to get the Klimt lesson and some others. Looking forward to seeing you inside the club! Klimt Exhibition coming to the S.F. Bay Area this month……..thank you! Wish list: more bundles related to travelling exhibits to major California museums. Great idea…do you have a list? Glad you’re a Sparkler! Rousseau Bundle is loaded on Monday! I am not sure if I am still a. Member? I signed up last year but I keep getting emails inviting me to join sparklers. Thought I already did? If you can access the Sparklers Club website, are receiving our weekly Sparkler Monday newsletter, then you are a member. Are your payments going through? You should direct questions to support@deepspacesparkle.com. Oh so inspiring and achievable! Thank you! i’d love to join the ciub-how long do I have to wait in line? I love the Klimt bundle! Even the overview gives a lote of ideas! i really want to be a member…how do I do that?